As children explore and interact with the world, they will inevitably put foreign bodies into their mouths and swallow some of them. Most swallowed foreign bodies pass harmlessly through the gastrointestinal (GI) tract. Foreign bodies that damage the GI tract, become lodged, or have associated toxicity must be identified and removed. Children with preexisting GI abnormalities (eg, tracheoesophageal fistula, stenosing lesions, previous GI surgery) are at an increased risk for complications. 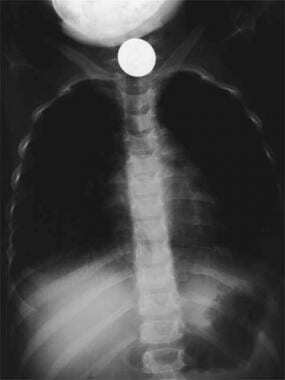 Although adults most often present to the ED because of health problems related to ingestion of radiolucent foreign bodies (typically food), children usually swallow radiopaque objects, such as coins, pins, screws, button batteries, or toy parts. Although children commonly aspirate food items, it is less common for small children to present because of foreign body complications due to food ingestion. Swallowed objects are shown in the images below. A swallowed coin lodged at the thoracic inlet. Image courtesy of Gregory Conners, MD, MPH. 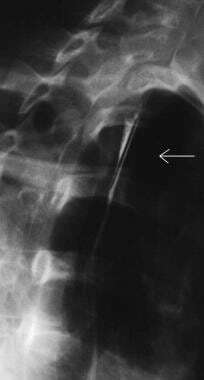 A swallowed radiolucent object (plastic guitar pick) is made visible in the upper esophagus after ingestion of barium. Image courtesy of Raymond K. Tan, MD, and Gregory Conners, MD, MPH. Most complications of pediatric foreign body ingestion are due to esophageal impaction, usually at one of three typical locations. The most common site of esophageal impaction is at the thoracic inlet. Defined as the area between the clavicles on chest radiograph, this is the site of anatomical change from the skeletal muscle to the smooth muscle of the esophagus. The cricopharyngeus sling at C6 is also at this level and may "catch" a foreign body. About 70% of blunt foreign bodies that lodge in the esophagus do so at this location. Another 15% become lodged at the mid esophagus, in the region where the aortic arch and carina overlap the esophagus on chest radiograph. The remaining 15% become lodged at the lower esophageal sphincter (LES) at the gastroesophageal junction. Pointed objects, such as thumbtacks, may become impaled and, therefore, lodged anywhere in the esophagus. Small objects, such as pills and smaller button batteries, may adhere to the slightly moist esophageal mucosa at any point. Once a swallowed foreign body reaches the stomach of a child with a normal GI tract, it is much less likely to lead to complications. Foreign bodies occasionally become lodged at the ileocecal valve. Coins made largely from zinc, most notable United States cents, have been reported to interact with stomach acid leading to stomach ulceration. Foreign-body — induced appendicitis has been reported. Other exceptions include pointed or toxic foreign bodies or objects too long (ie, >6 cm) or too wide (ie, >2 cm) to pass through the pyloric sphincter. Children with known GI tract abnormalities are more likely to encounter complications. Previous surgery may cause abnormalities of peristalsis, increasing the likelihood of foreign body impaction. For example, children who have had surgery to correct pyloric stenosis are more likely to retain a foreign body in the stomach. Previously unsuspected lower GI tract abnormalities may present as a complication of foreign body ingestion. For example, a small foreign body may become lodged in a Meckel diverticulum. A foreign body lodged in the GI tract may have little or no effect; cause local inflammation leading to pain, bleeding, scarring, and obstruction; or erode through the GI tract. Migration from the esophagus most often leads to mediastinitis but may involve the lower respiratory tract or aorta and create an aortoenteric fistula. Migration through the lower GI tract may cause peritonitis. Most foreign bodies pass harmlessly through the GI tract and are eliminated in the stool. Systemic reactions, such as from nickel allergy, are unusual but have been reported, typically in massive ingestions or occupational exposures. Retained foreign bodies may cause GI mucosal erosion, abrasion, local scarring, or perforation. Esophageal foreign body migration may lead to peritonitis, mediastinitis, pneumothorax, pneumomediastinum, pneumonia, or other respiratory disease. Migration into the aorta may produce an aortoenteric fistula, a horrific complication with a high mortality rate. Complications of removal procedures may lead to iatrogenic morbidity or mortality from the procedure or from accompanying sedation/anesthesia. The male-to-female ratio in young children is 1:1. In older children and adolescents, males are more commonly affected than females. Children of all ages ingest foreign bodies. However, incidence is greatest in children aged 6 months to 4 years. This reflects the tendency of small children to use their mouths in the exploration of their world. Younger children may be "fed" foreign bodies by older children or be intentionally given foreign bodies by abusive adults. In the teenaged years, concomitant psychiatric problems, mental disturbances, and risk-taking behaviors may lead to foreign body ingestion. Conners GP, Chamberlain JM, Ochsenschlager DW. Symptoms and spontaneous passage of esophageal coins. Arch Pediatr Adolesc Med. 1995 Jan. 149(1):36-9. [Medline]. Hurtado CW, Furuta GT, Kramer RE. Etiology of esophageal food impactions in children. J Pediatr Gastroenterol Nutr. 2011 Jan. 52(1):43-6. [Medline]. Pavlidis TE, Marakis GN, Triantafyllou A, Psarras K, Kontoulis TM, Sakantamis AK. Management of ingested foreign bodies. How justifiable is a waiting policy?. Surg Laparosc Endosc Percutan Tech. 2008 Jun. 18(3):286-7. [Medline]. O'Hara SM, Donnelly LF, Chuang E, Briner WH, Bisset GS 3rd. Gastric retention of zinc-based pennies: radiographic appearance and hazards. Radiology. 1999 Oct. 213(1):113-7. [Medline]. Robinson AJ, Bingham J, Thompson RL. Magnet induced perforated appendicitis and ileo-caecal fistula formation. Ulster Med J. 2009 Jan. 78(1):4-6. [Medline]. Vijaysadan V, Perez M, Kuo D. Revisiting swallowed troubles: intestinal complications caused by two magnets--a case report, review and proposed revision to the algorithm for the management of foreign body ingestion. J Am Board Fam Med. 2006 Sep-Oct. 19(5):511-6. [Medline]. Fenton SJ, Torgenson M, Holsti M, Black RE. Magnetic attraction leading to a small bowel obstruction in a child. Pediatr Surg Int. 2007 Dec. 23(12):1245-7. [Medline]. Pryor HI 2nd, Lange PA, Bader A, Gilbert J, Newman K. Multiple magnetic foreign body ingestion: a surgical problem. J Am Coll Surg. 2007 Jul. 205(1):182-6. [Medline]. Shastri N, Leys C, Fowler M, Conners GP. Pediatric button battery and small magnet coingestion: two cases with different outcomes. Pediatr Emerg Care. 2011 Jul. 27(7):642-4. [Medline]. Conners GP, Chamberlain JM, Weiner PR. Pediatric coin ingestion: a home-based survey. Am J Emerg Med. 1995 Nov. 13(6):638-40. [Medline]. Abbas MI, Oliva-Hemker M, Choi J, Lustik M, Gilger MA, Noel RA, et al. Magnet ingestions in children presenting to US emergency departments, 2002-2011. J Pediatr Gastroenterol Nutr. 2013 Jul. 57(1):18-22. [Medline]. Lim CW, Park MH, Do HJ, Yeom JS, Park JS, Park ES, et al. Factors Associated with Removal of Impactted Fishbone in Children, Suspected Ingestion. Pediatr Gastroenterol Hepatol Nutr. 2016 Sep. 19 (3):168-174. [Medline]. Susy Safe Working Group. The Susy Safe project overview after the first four years of activity. Int J Pediatr Otorhinolaryngol. 2012 May 14. 76 Suppl 1:S3-11. [Medline]. Kavanagh KR, Batti JS. Traumatic epiglottitis after foreign body ingestion. Int J Pediatr Otorhinolaryngol. 2008 Jun. 72(6):901-3. [Medline]. Brayer AF, Sciera M, Conners GP. Pediatric coin ingestion: an unusual presentation. Int J Pediatr Otorhinolaryngol. 2000 Oct 16. 55(3):211-3. [Medline]. Riddlesberger MM Jr, Cohen HL, Glick PL. The swallowed toothbrush: a radiographic clue of bulimia. Pediatr Radiol. 1991. 21(4):262-4. [Medline]. Silverberg M, Tillotson R. Case report: esophageal foreign body mistaken for impacted button battery. Pediatr Emerg Care. 2006 Apr. 22(4):262-5. [Medline]. Jackson JT, Conners GP. Radiographic identification of an esophageal United States one cent coin. Visual Journal of Emergency Medicine. 2017. 9:31-32. Conners GP, Hadley JA. Esophageal coin with an unusual radiographic appearance. Pediatr Emerg Care. 2005 Oct. 21(10):667-9. [Medline]. Conners GP. Diagnostic uses of metal detectors: a review. Int J Clin Pract. 2005 Aug. 59(8):946-9. [Medline]. Conners GP. Finding aluminum foreign bodies. Pediatr Rev. 2000 May. 21(5):172. [Medline]. Kramer RE, Lerner DG, Lin T, et al. Management of ingested foreign bodies in children: a clinical report of the NASPGHAN Endoscopy Committee. J Pediatr Gastroenterol Nutr. 2015 Apr. 60 (4):562-74. [Medline]. Conners GP. Esophageal coin ingestion: going low tech. Ann Emerg Med. 2008 Apr. 51(4):373-4. [Medline]. Dahshan AH, Kevin Donovan G. Bougienage versus endoscopy for esophageal coin removal in children. J Clin Gastroenterol. 2007 May-Jun. 41(5):454-6. [Medline]. Arms JL, Mackenberg-Mohn MD, Bowen MV, Chamberlain MC, Skrypek TM, Madhok M. Safety and efficacy of a protocol using bougienage or endoscopy for the management of coins acutely lodged in the esophagus: a large case series. Ann Emerg Med. 2008 Apr. 51(4):367-72. [Medline]. Conners GP. A literature-based comparison of three methods of pediatric esophageal coin removal. Pediatr Emerg Care. 1997 Apr. 13(2):154-7. [Medline]. Gonzalez KW, Reddy SR, Mundakkal AA, St Peter SD. The financial impact of flipping the coin. J Pediatr Surg. 2016. 52:153-155. [Medline]. Bhargava R, Brown L. Esophageal coin removal by emergency physicians: a continuous quality improvement project incorporating rapid sequence intubation. CJEM. 2011 Jan. 13(1):28-33. [Medline]. Sharieff GQ, Brousseau TJ, Bradshaw JA, Shad JA. Acute esophageal coin ingestions: is immediate removal necessary?. Pediatr Radiol. 2003 Dec. 33(12):859-63. [Medline]. Peters NJ, Mahajan JK, Bawa M, Chabbra A, Garg R, Rao KL. Esophageal perforations due to foreign body impaction in children. J Pediatr Surg. 2015 Feb 7. [Medline]. NBIH Button Battery Ingestion Triage and Treatment Guideline. Poison Control: National Capital Poison Center. Available at https://www.poison.org/battery/guideline. September 2016; Accessed: December 18, 2017. Litovitz T, Whitaker N, Clark L. Preventing battery ingestions: an analysis of 8648 cases. Pediatrics. 2010 Jun. 125(6):1178-83. [Medline]. Lee JH, Lee JH, Shim JO, Lee JH, Eun BL, Yoo KH. Foreign Body Ingestion in Children: Should Button Batteries in the Stomach Be Urgently Removed?. Pediatr Gastroenterol Hepatol Nutr. 2016 Mar. 19 (1):20-8. [Medline]. Conners GP. Management of asymptomatic coin ingestion. Pediatrics. 2005 Sep. 116(3):752-3. [Medline]. Conners GP, Chamberlain JM, Ochsenschlager DW. Conservative management of pediatric distal esophageal coins. J Emerg Med. 1996 Nov-Dec. 14(6):723-6. [Medline]. Varga Á, Kovács T, Saxena AK. Analysis of Complications After Button Battery Ingestion in Children. Pediatr Emerg Care. 2018 Jun. 34 (6):443-446. [Medline]. Lateral radiograph demonstrating the distinctive two-step profile of a button (disk) battery in the esophagus. Frontal view of same esophageal button (disk) battery; note distinctive double-circle appearance, useful to differentiate a button battery from a coin. Fast Five Quiz: Are You Prepared to Confront Foreign Bodies in Patients?